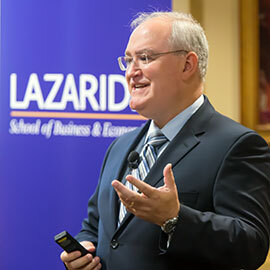 The Lazaridis School of Business & Economics hosted its most recent Economist-in-Residence, Craig Alexander, senior vice president and chief economist of the Conference Board of Canada, on Oct. 25. Alexander’s topic, Canada’s Great Challenge: Productivity, Innovation and Competitiveness, piqued the interest of a packed room of faculty, staff, students and community members alike. “Productivity has a terrible connotation,” said Alexander, who cited that 80% of the rise in standard of living comes from productivity. He explained that economies grow when one of two things happen: there are more workers or the existing workforce is used more productively. So what’s changing the economy? Alexander offered a number of structural forces that are shaping Canada’s outcomes: globalization, technical change, shifts in labour demand – de-industrialization, decline in unionization, increase in high-skill jobs and a decrease in mid-skilled jobs – aging demographics, urbanization and climate change. “Canada is becoming a more service-oriented economy,” said Alexander. “Manufacturing is moving towards higher-value-added activities.” This transition means producing less textiles, apparel and paper, and more chemicals, machinery and transportation equipment. How can Canada become more competitive? Alexander suggests that the country should invest in the latest technologies and building a skilled workforce, commercialize more ideas, remove barriers that stifle business growth and improve access to capital for growing companies.